"Thank you for everyone accepting who I am and the dedication I have put into my work to be the best player I could be. But now it's time to move forward," he wrote. "... Cheers to all who have been part of this journey, cheers to the past for the incredible memories, and a HUGE cheers to the uncertain of what's next." Quarterback Tom Brady, who has thrown twice as many touchdowns to Gronkowski (78) as any other player (Randy Moss, 39) in his career, commented on the tight end's Instagram post, writing, "Love u man!! The!! Couldn't be a better person or teammate!!!!" Bill Belichick, whose 19-year tenure as Patriots coach encompassed Gronkowski's career, said in statement issued by the team that it has been "a pleasure and a privilege" to coach Gronkowski. "Rob will leave an indelible mark on the Patriots organization and the game as among the best, most complete players at his position to ever play," Belichick said. 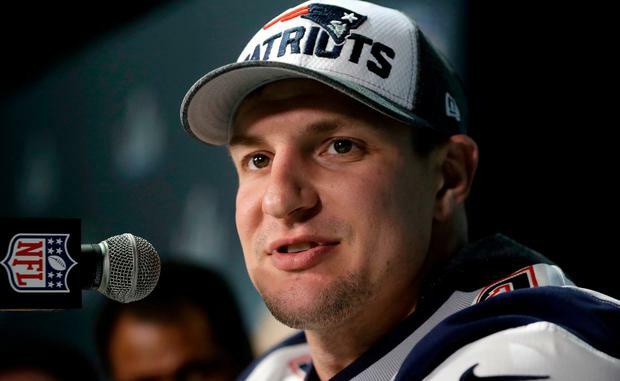 Gronkowski -- who has battled serious injuries to his back and knee and missed 29 games in his career -- openly pondered retirement last offseason, but he returned for another campaign. "I'm not going to lie and sit here and say every week is the best," Gronkowski said. "Not at all. You go up. You go down. You can take some serious hits. Try to imagine getting hit all the time and trying to be where you want to be every day in life. It's tough. It's difficult." "His production spoke for itself, but his daily attitude, unmistakably positive energy wherever he went and toward whoever he touched will never be forgotten," Belichick said. Patriots chairman and CEO Robert Kraft said in a statement that he looks forward to honoring Gronkowski "in the near future as both a Patriots and Pro Football Hall of Famer." "As great of a player as he was, he is an even better person and ambassador of the game," Kraft said. "Throughout his career, he made countless appearances in the community and there was no better remedy for hospital patients than a visit from Gronk." Alexander Britton Tom Brady has won his sixth Super Bowl as the veteran quarterback led his New England Patriots to a 13-3 victory over the Los Angeles Rams.